Whether you are a procrastinator or you hate wasting paper on paper, you may find yourself in a classic Christmas dilemma: several gifts to give and seemingly nothing to wrap them with. Most stores are now closed and your loved ones demand tradition. It's that oh cr*p moment of the holidays. Here, 7 creative and mostly acceptable ways to wrap your gifts without the rolls. 1. Aluminum Foil: Stocked in nearly everyone's kitchen, this shiny foil is easy to fold, sticks without tape and can feel glam or space-aged depending on what you tell people. You can even repurpose what you've used when it's time to wrap the ham. 2. Holiday Napkins: Holiday napkins often come in prints that recall wrapping paper. Plus: They're often so stiff that this is a much better use for them than wiping your face. 3. Scarves: Bring out the Etsy pro in you by wrapping your gifts in scarves or bandanas (bonus gift!). You can use tape or simply tie the scarf together. If you receive odd looks regarding the presentation, explain that you're still mastering the art of Furoshiki – the Japanese tradition of wrapping with cloth. 4. Pages from a Book: Newspaper is a classic, but if you don't have the lifestyle section, things could get a bit dark. For other brainy paper, hit the basement for an outdated encyclopedia or textbook. With a box cutter, carefully cut the pages from the binding, tape pages together to create larger sheets and proceed with wrapping your gift. The text can also add a personal touch. Just ensure that you don't cut up anyone's favorite book or give grandma something packaged with a chapter from Fifty Shades of Grey. 5. Old Map: With GPS, you really don't need those road maps in the glove compartment. But you ask, "What about emergencies?" That's what highway patrols are for. 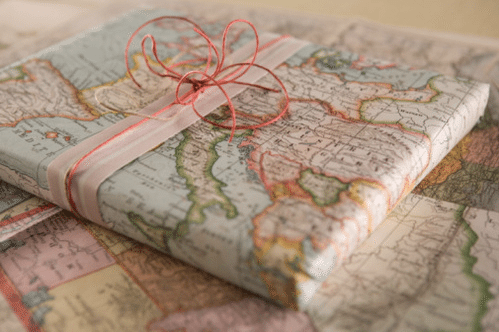 This wrapping is perfect for world travelers and will look intentional when you tell them that. 6. T-shirt: Cotton shirts are an easily accessible alternative to wrapping paper. Use a new one with a humorous message. As a last resort, you could also take one from your dad's drawer. Ensure that there are no holes, coffee stains or..erm yellowing. And avoid never-been-worn shirts given by aunts on holidays past. They have hawk eyes. 7. Socks: Although it limits the size of the gift you can wrap, a sock is one of the easiest options. We recommend a new (or at least clean), non-gym sock, preferably something Christmas-y. Place gift in sock and tie opening together with ribbon. Bonus when you include the matching sock in the package.